Sometimes ideas are in my head for years before they come out. Maybe they just need to brew a while, like a rich lager, or the nuances blend and soak in, like the ingredients in your favorite coleslaw dressing. To have work at various price points, and to experiment with some new directions, I’ve been making small pieces. When I do that, I also tend to be a little freer and experimental in a loose, whacky sort of way. Like the difference between doodling on scrap paper and drawing on the expensive stuff. I am creating a new body of work and will be making some bigger pieces. A little scary, what with the economy, but this will feed my soul. With the two sides of my brain doing battle like this, in my early clay days, I felt pressure and angst (as ceramics professor Mike Sanford correctly described it). Still, I had fun, in a manic, tortured sort of way. Here is a product of those times. I am very proud of her. Every component was built hollow. 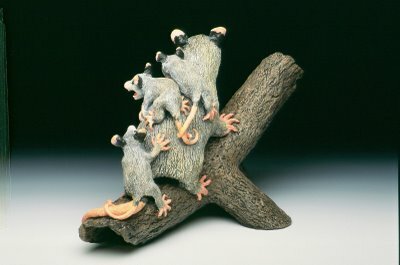 Note that the possum and log are both tripods. 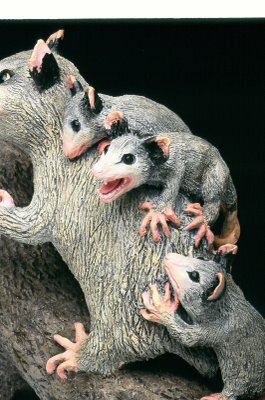 You can’t tell from the images, but the ears and tails have realistic texture and are very possum-y. Check out the teeth on that little one! You don’t have to understand Possum to get the message! After the work was fired, I painted it with many layers of acrylic paint. Now, with (1) a few years of experience under my belt, (2) the DESIRE to fuss, in a good way, and, (3, a harder lesson), knowing when to STOP, I’m going to give myself a gift of time. Time to create more pieces like this, in all their fussy detail and glory! Thank you, Possum Lady! It doesn’t show in these photos, but the possums have very respectable rat tails. I used nylon mesh bag to get that effect. 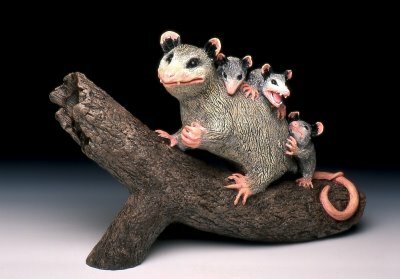 Not everyone appreciates possum adaptations (I don’t understand it–they are remarkable animals), but I figured you might!